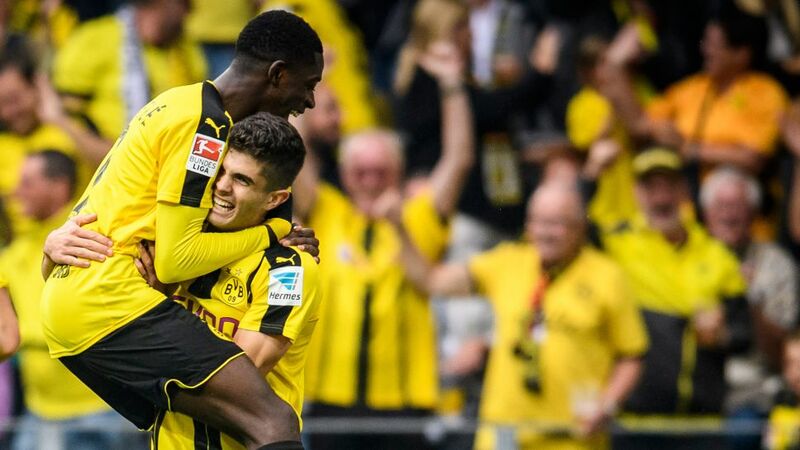 Only Ousmane Dembele laid on more goals and attempted more dribbles than Christian Pulisic for BVB last season. Borussia Dortmund fans may be mourning the loss of Ousmane Dembele, but one young man will be licking his lips at the prospect of filling the void left by the 20-year-old at the Signal Iduna Park. USA ace Christian Pulisic was expected to take further strides towards global stardom this season, even before BVB sold Dembele to the Spanish giants for a sum of €105 million plus bonuses worth 40 per cent of the fee. However, the former Rennes star’s departure will surely signal more responsibility for Pulisic, who has started the 2017/18 campaign in electric fashion. After scoring the opening goal in the Black-Yellows’ Supercup defeat to Bayern Munich on 5 August, Pulisic stole the show in Dortmund’s 3-0 victory at Wolfsburg on Matchday 1, scoring one and assisting another in a man-of-the-match performance that will have delighted head coach Peter Bosz and sent Borussia fans home with huge smiles etched across their faces. There was much more to Pulisic’s display than just his goal and assist, though. The Hershey-born youngster performed more "intensive" runs than any other Dortmund player at the Volkswagen Arena apart from star striker Pierre-Emerick Aubameyang, while only Gonzalo Castro, Marc Bartra and Lukasz Piszczek had covered more ground than the 18-year-old prior to his 86th-minute substitution. It is worth noting that only Dembele laid on more goals and attempted more dribbles for BVB than Pulisic last term, and while the American may not quite possess the blistering pace of the France international - despite being exceptionally quick himself - his display against the Wolves proved once again that he is more than capable of filling the latter's sizeable shoes. “I’ve been fortunate that I have good athletic ability, just in general," Pulisic said in a recent interview with The Guardian. "Quick, strong, able to bounce off players, trying to be strong in winning tackles and annoying to play against, pretty much. "I've also been lucky, and I'm just thankful that I've been able to stay healthy and the coaches have felt they can trust me to play, whether it's been off the bench or starting." Indeed, Pulisic’s near-superhuman ability to stay fit (he didn’t miss a single game through injury last season) also gives him a distinct advantage over his BVB team-mates when it comes to taking over the mantle of Dembele - most notably Marco Reus, who is sidelined until 2018 after suffering knee ligament damage in the DFB Cup final victory against Eintracht Frankfurt in May. Throw in head coach Bosz’s reputation for nurturing and improving young players and it would take a brave man to bet against Pulisic, who has smashed record after record in his fledgling career, setting more best-marks in 2017/18. He took full advantage of his next opportunity to set BVB pulses racing on Saturday when Dortmund hosted Hertha Berlin at home. Pulisic may not have got his name on the scoresheet but he was hugely impressive throughout, his directness and willingness to beat his marker creating a number of chances for the Black-and-Yellows. He made 41 sprints over the 90 minutes - seven more than the next player - and had five attempts at goal. By way of comparison, Hertha only managed eight collectively. If Pulisic can maintain his early-season form, Dortmund fans won't be mourning Dembele's exit for too much longer. Quiz: How well do you know Pulisic?